Simple Recipes for a Wholesome Start Nothing compares with making your own baby food: It's fresh and unprocessed, you choose what goes into it, and it is a delicious way to introduce your child to a world of flavors. In Real Baby Food, Jenna Helwig helps you fit this loving act into a busy day's routine by making the process easy, fast, and flexible with 100 meals to begin a lifetime of healthy eating—from the moment your baby takes her first bite of solid food through her toddler years when she's happily ensconced in a booster seat at the family table. Real Baby Food is your guide to these important first years of eating. Find the building blocks of starting your child on solid foods, how to recognize food allergies, and easy ways to cook in bulk. Recipes progress from single-ingredient purées to multi-flavor blends like Salmon, Kale, and Sweet Potato Smash; then move on to finger foods—Turkey Meatloaf Bites, Maple Graham Animals—and finally toddler meals and snacks. Most can be made ahead and frozen, many are easily adapted for grown-up tastes, and all include full nutritional information. 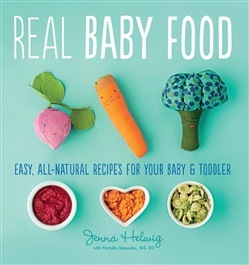 Acquista Real Baby Food in Epub: dopo aver letto l’ebook Real Baby Food di Jenna Helwig ti invitiamo a lasciarci una Recensione qui sotto: sarà utile agli utenti che non abbiano ancora letto questo libro e che vogliano avere delle opinioni altrui. L’opinione su di un libro è molto soggettiva e per questo leggere eventuali recensioni negative non ci dovrà frenare dall’acquisto, anzi dovrà spingerci ad acquistare il libro in fretta per poter dire la nostra ed eventualmente smentire quanto commentato da altri, contribuendo ad arricchire più possibile i commenti e dare sempre più spunti di confronto al pubblico online.